These cheesy stuffed mushrooms are a light vegetarian meal or a hearty side dish. 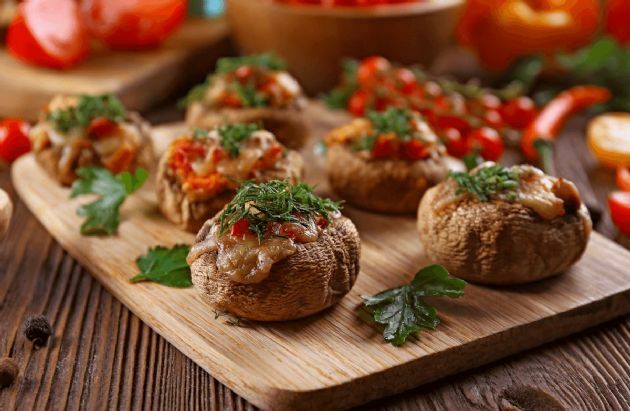 These cheesy stuffed mushrooms are a light vegetarian meal or a hearty side dish. 2. In a small bowl, combine tomatoes, mozzarella, 1/2 teaspoon of the olive oil, rosemary, pepper and garlic. 3. Using a spoon, scoop out the gills of the mushroom caps and remove the stems and discard. 4. In a small bowl, mix 1/2 teaspoon of the olive oil, balsamic vinegar and soy sauce. Using a pastry brush, brush the soy sauce mixture on both sides of the mushroom caps. 5. Grill the caps, stem side down first for 5 minutes on each side or until soft. 6. Spoon 1/4 cup of the tomato and cheese mixture into each cap, cover and grill for about 3 minutes or until cheese has melted.